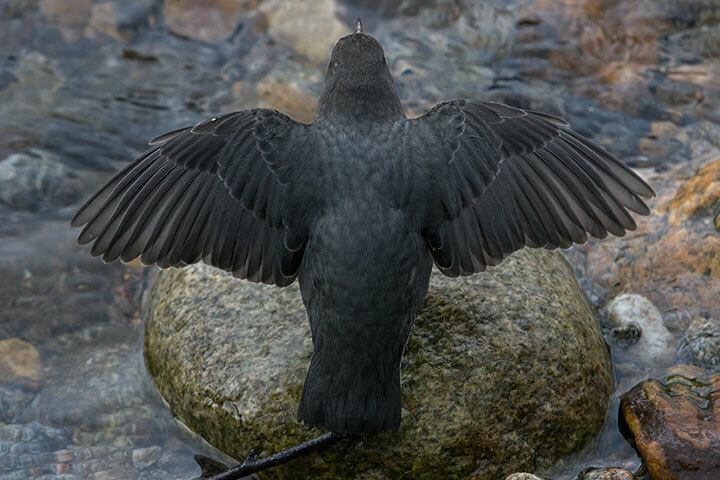 Spread-wing dipper posted Nov. 6. Earlier this the month, I posted the image shown to the right. I wondered about the dipper’s spread-wing stance. Large birds do this to dry their wings, warm their wings, or cook their parasites. None of these seemed to apply to dippers. Why was it doing this? Joanne Siderius is the Senior Naturalist at Kokanee Creek Park, where the picture was taken. She said, “Oh, that is a territorial threat posture directed towards another dipper.” Interesting — there was, indeed, another dipper present. Yesterday’s observations produced a technically poor (sloppy framing, one bird out of focus), but striking image that underscores Joanne’s contention. 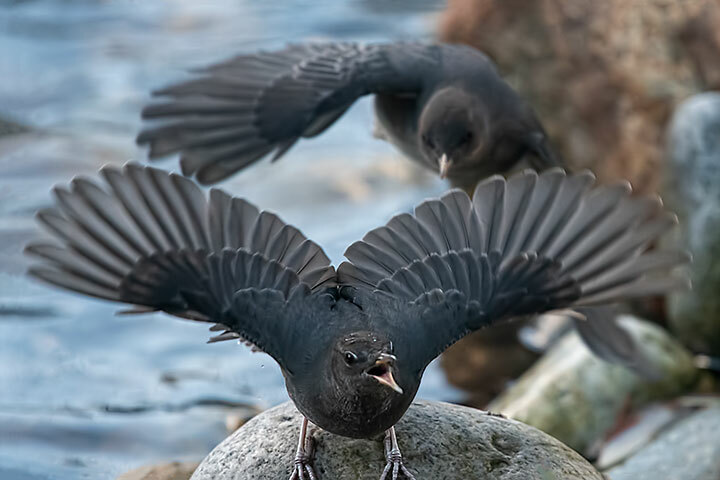 It shows the aggressive reaction of one dipper to being challenged by the other. Yet, as quickly as tempers flared, they passed. Moments later both dippers were foraging quietly on adjacent portions of the creek. Two dippers had moved close as they foraged. So, one faced the other and spread its wings in a territorial challenge. This picture was taken just as it realized that the other dipper wasn’t about to cede what it thought was its portion of the creek. Helen, accidental is a slippery term. When I saw the earlier spread wings, I started taking multiple pictures in anticipation of something interesting happening. Often this approach produces junk (that is what the delete button is for). A fifth of a second prior to this picture, there was only one bird in the scene; a fifth of a second after it, there were none. One’s reaction time is not fast enough to have seen this chase and then to have pushed the button, so in that sense the picture was fortuitous, but the possibility had been anticipated. I’m with Helen: accidental or semi-accidental or serendipitous or whatever, your second shot captures a story second to none! Thanks so much for sharing. 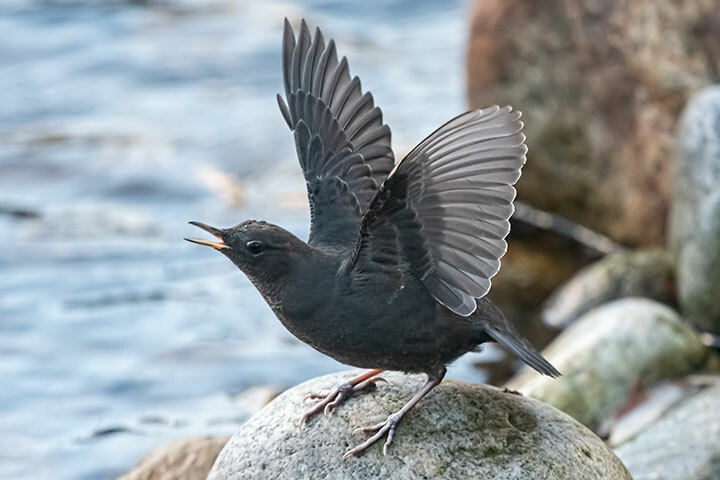 Very interesting story and images of the dippers!